The superior quality achromatic objective has an aperture of and has focal length of The carriage of the telescope (with up and down motion, improved design, college pattern) tube is fitted with vertical movement by a fine micrometer achromatic objective has an aperture of 25mm and has focal length of 17.5cm. 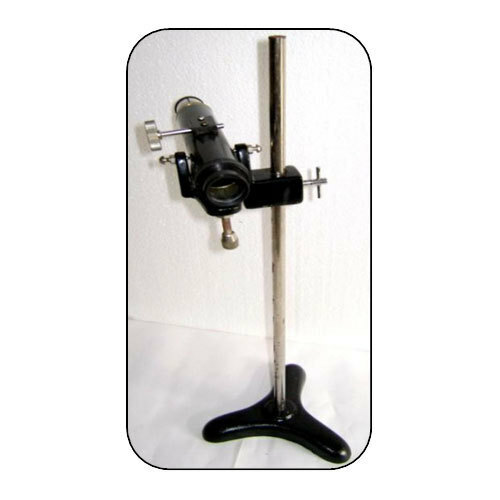 The carriage of the telescope (with up and down motion, improved design, college pattern) tube is fitted with vertical movement by a fine micrometer screw. Focusing arrangement is given by rack and pinion.Complete on a heavy metallic stand having pillar of 18â€ length with scale and scale holder. Established as a Sole Proprietorship firm in the year 2012, we “Reliant Lab” are a leading Manufacturer and Trader of a wide range of Laboratory Glassware, Fluid Mechanics Lab Instruments, Heat Transfer Lab, etc. Situated in Ambala (Haryana, India), we have constructed a wide and well functional infrastructural unit that plays an important role in the growth of our company. We offer these products at reasonable rates and deliver these within the promised time-frame. Under the headship of our mentor “Mr. Hardik Goel”, we have gained a huge clientele across the nation. We exports our products All over the world.